We’d love your help. 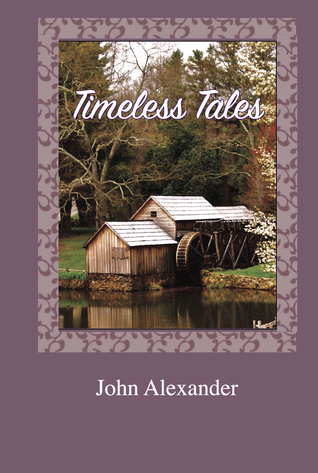 Let us know what’s wrong with this preview of Timeless Tales by John D. Alexander. This debut book of poetry by John Alexander offers inspiration. As these lilting verses roll off your tongue, let the words soothe your weary soul. Written especially for you and your inner child, the poems reach into your soul to that child within you. Nurture yourself with rhymes that speak to your heart. You can keep them to yourself, or you can share them with the chil This debut book of poetry by John Alexander offers inspiration. As these lilting verses roll off your tongue, let the words soothe your weary soul. Written especially for you and your inner child, the poems reach into your soul to that child within you. Nurture yourself with rhymes that speak to your heart. You can keep them to yourself, or you can share them with the children in your life. To ask other readers questions about Timeless Tales, please sign up. This book of inspirational rhymes is truly charming. The cadences and the clear attention to the craft make it impossible not to feel good while reading this. The Bible passages included were fitting, and the messages of the poetry are spiritually uplifting. I think my favourite of these is Donkey Tale. The imagery and the presence of God just made me joyful. I'm so glad that I have this so that in trying times I can just pick one of these rhymes to comfort me. A comfortable book of poems, full of sincerity and warmth. Written in a natural rhyming cadence, this debut collection includes moral tales starring animal heroes, poignant vignettes from the author's life, and encouragement for the Christian soul. Effortlessly combining the mundane and profound, these poems are truly timeless. I did not expect this to be a somewhat religious poetry book (think teaching about the way of life and being kind, trusting on God and being thankful religious). This poetry book is separated into 3 parts. The first part, poems for your inner child, appeals more to the child within you, using characters like mice in order to teach good values. The second part, blessings for you, share the hope for happiness and aid in our daily life where there are troubles and cares. The third part and final par I did not expect this to be a somewhat religious poetry book (think teaching about the way of life and being kind, trusting on God and being thankful religious). This poetry book is separated into 3 parts. The first part, poems for your inner child, appeals more to the child within you, using characters like mice in order to teach good values. The second part, blessings for you, share the hope for happiness and aid in our daily life where there are troubles and cares. The third part and final part, heart to heart, is where Alexander shares his personal stories. All these were written through rhymes. It was an extremely fun read as the words flow so smoothly, yet the rhymes have a deep meaning to it. Some were easy to understand and some needed a little bit of thinking. Either way, it teaches good values and encourages us to not only focus on our busy lives but to reflect on the blessings we have. What a wonderful collection of poems this is. The inside is just as lovely as in the outside cover art. There is peace and comfort and warmth found within the pages of Timeless Tales. One of my favorites is "Donkey Tale," which is the tale of a lonely, awkward donkey who is made fun of by others until he meets a man who lifts his burdens. The man ends up riding on his back into the city where palms are laid at their feet. "The Grand's Christmas" is another sweet poem about grandparents spending What a wonderful collection of poems this is. The inside is just as lovely as in the outside cover art. There is peace and comfort and warmth found within the pages of Timeless Tales. One of my favorites is "Donkey Tale," which is the tale of a lonely, awkward donkey who is made fun of by others until he meets a man who lifts his burdens. The man ends up riding on his back into the city where palms are laid at their feet. "The Grand's Christmas" is another sweet poem about grandparents spending their holiday together, but without their family, and how the Bible brings them comfort. There are several Scripture passages within this collection's pages as well. John Alexander lives in Frisco, TX with his beautiful wife and Charlie Brown his Cavalier. During the last five years of his forty-four year career in the high tech industry John discovered his love for writing. He now spends full time pursuing that passion.